With the temperatures falling and the nights getting longer, the 2010 airshow season is rapidly becoming a distant memory. It was one filled with extreme highs and the occasional lows, but one that was very memorable all the same thanks to the important 70th Anniversary of the Battle of Britain which was marked at many shows up and down the UK and even in Europe. It was also a good season for many UK acts. Some started very early with extraodinary trips to the Middle East during January for the Inaugural Bahrain International Airshow and the established Al Ain Aerobatics Show in the United Arab Emirates. Both shows saw significant UK involvement, not only in terms of airshow acts but also expertise in the running of the shows and flying displays. Al Ain included several UK based classic jets for the first time all of which completed epic transits from the UK through the european winter and hostile desert environments including Jonathon Whalley in his Hunter, Team Viper and a pair of Gnats. Back in the UK, the season got off to something of a shaky start over the first May Bank Holiday Weekend. The weather was less than helpful for both events at Old Warden and Abingdon with brisk winds and rain affecting both events. However, Abingdon had to cope without it’s runway after it was declared unfit for use for fixed wing aircraft at the last minute by Defence Estates despite continued use by the locally based Volunteer Gliding Schools. That meant all the airshow acts had to use other bases such as RAF Brize Norton, Oxford, Bicester and Kemble. Abingdon had managed to secure it’s first international flying display participation from the Royal Netherlands Air Force F-16AM Fighting Falcon which was a major boost to the show and the crew stated that they were perfectly happy with the condition of the runway! We hope the issues over the runway can be resolved in time for the 2011 event. Abingdon is often the first chance to sample the Royal Air Force solo displays and this year the Tutor, Tucano and Hawk displays making their 2010 débuts at the show. Flt Lt Bill Ramsey presented a refined version of his 2009 display showcasing the aerobatic abilities of little Grob Tutor while it was good to see the Tucano back on the circuit having missed it during the 2009 season. The Tucano Display Team led by Flt Lt Tom Bould presented two spectacularly painted airframes representing Spitfires flown during the Battle of Britain by 72 Squadron commanders. The Hawk too emerged with another patriotic colour scheme celebrating the 50th Anniversary of No 4 Flying Training School and was flown in a very original display by Flt Lt Tom Saunders. Sadly, Tom’s display season was cut short in somewhat controversial circumstances though it was NOT due to any incident that occurred during a flying display as widely reported in the media and public safety was never compromised. Stepping into the gap was Flt Lt Scott Griffith who put together a short “Hawk Role Demo” to keep the Hawk in the public eye during the second half of the season. The Typhoon display was first seen in public later in May at the Southend Air Festival flown by Flt Lt Tim Clements. This year’s Typhoon display seemed a little disappointing to many, particularly when seen against some of the European F-16 displays which seem to better show off the performance of the 30 year old fighters. The Typhoon display seemed tame by comparison which was a little unexpected considering the advances in design and technology over the F-16. Southend marked the first of the year’s big seafront airshows which have been increasingly popular in recent years. The current economic climate is particularly tough for these events as for the most part they are spearheaded and funded by local councils. Southend presented it’s usual mix of flying displays to large crowds despite the loss of the Red Arrows who were forced to delay the start of their 2010 display season following a training accident in Crete and the need to train up a former member of the team, Flt Lt Pablo O’Grady, to replace the injured Mike Ling. Perhaps my overall highlight of May was the Henham Park Wings and Wheels event. This event combined a small flying display with a classic car rally in the wonderful grounds of Henham Park. The event was the debut for AeroSuperBatic’s latest incarnation of their Wingwalking display team – the Breitling Wingwalkers. The team are one of the most regular sights on the display circuit and never cease to impress with their stunning mix of classic biplanes and interpid wingwalkers waving from the top wing. Also in May we took in a return visit to Volkel in de Wolken in the Netherlands. Despite some poor weather, it was another excellent show featuring some very different acts from Europe including the CAPTENS which were very impressive as was the noisy performance of four Volkel based F-16s. As well as new colours for old teams, there were several brand new acts for 2010. The Twister Duo perhaps had the biggest profile of the new teams appearing at several major events highlighting the excellent qualities of this kit built composite aircraft perfoming at both daytime and evening events with wingtip fireworks. Pitts Specials saw something of a resurgence on the display scene with two very different pairs displays. Richard Grace and Dave Pulleston put together the Pitts Pair with a pair of the smaller, but very smart S-1D Specials. Later in the season we also saw the GEE WIZZ Pitts Duo with pilots Alister Kay and Steve Jones flying the bigger more powerful S2S model. Alister also formed the “RV-8tors” with Andy Hill flying a pair of Vans RV-8 aircraft. Completing the line-up of new “duos” were Bob Grimstead and Matthew Hill with the Redhawk Duo – a pair of Founier RF4Ds which spark memories of the Unipart Skyhawks displays. Further reminders if airshows past came from Brendan O’Brien who returned to display flying with his unique trailer top landing and crazy flying routine in a clipped wing J3 Cub. Brendan’s display brings back a certain bit of showbiz and razzmatazz to flying displays which is most welcome in these times where displays have been accused in certain quarters of being a little mundane. May also saw the first Duxford airshow of the year with the Battle of Britain Memorial Flight weekend and RAF Today event. Sadly this was the only UK airshow to be affected by the Eyjafjallajökull Volcano in Iceland which had shut down north european airspace in April. It was an excellent show and that level of quality continued right through the year. Flying Legends was once again presented mouth watering mix of Europe’s best warbirds of which my personal highlight was Jurgis Kairys’ display in the Polikapov I-16 Rata on the Sunday. The Autumn Airshow too was excellent celebrating the 65th Anniversary of Sally-B and the exploits of the Rothmans Aerobatic Team. However, the stand out event in Duxford’s calendar was the Battle of Britain Airshow. Few that attended the event with ever forget the excellent fourship of Hurricanes or the quite epic Spitfire finale featured 15 Spitfires and Kennet’s Seafire. The roar as the formation repositioned to the south, the main flypast and the magical tailchase sequence made this the airshow event of the year. June saw some very fine events too. The Heart of Scotland Airshow at Perth was an enjoyable show in great surroundings presenting a wonderful mix of local Scottish display acts on top of some of the more usual suspects. June also saw the first of the RAF shows at RAF Cosford. A late surprise for the Cosford crowds was the Red Arrows who managed to gain their Public Display Authority in time for the RAF’s first show of the season. Cosford was also notable for the first full displays in the UK by the RAF’s latest display teams – the Harrier GR9 and Tornado GR4 role demo teams. Both were extremely welcome additions to the display circuit providing some much need noise and spectacle to the show. Kemble and Margate both impressed, but the Biggin Hill International Air Fair was the highlight of June presenting a superb afternoon’s entertainment and a very poignant salute to the Battle of Britain. Sadly, this was the last ever Air Fair as it was later announced that Biggin Hill Airport would take over staging of public events at the airfield. The loss of the Air Fair is a great loss to the UK display circuit but we hope that the Air Displays International team led by Colin Hitchins will be able to find suitable replacement venues to work their magic on! July is traditionally the month for the biggest and most high profile UK shows of the year. Waddington opened the month with a welcome return to the form set by the show at the beginning of the decade presenting displays from Belgium, Czech Republic, France and Turkey on top of the usual strong RAF support. Yeovilton continued the trend with an equally impressive line-up on top of it’s stunning Martime Lynx Display and Commando Assault. The Vulcan made it’s first appearance of the year at Waddington and also made Yeovilton too ahead on a busy, if a little truncated season due to the late start of winter maintenance and modifications. It was another relatively successful season for the mighty delta but the continued hand-to-mouth funding is an area of concern. We have already seen a survival appeal which should see the Vulcan to the Sky Trust through the winter, but the reality is that they only JUST made it. It does appear public interest in funding the project is waning and VttS need more effective and secure fundraising methods for future display seasons which are likely to be tough for the more expensive display acts as airshow budgets will undoubtedly be stretched yet further. It was a Farnborough year too and despite the economic downturn, it was a most successful show for business and public alike. The weekend public days were absolutely packed thanks to some welcome warm weather (108,000 visitors over the weekend alone!) Sadly though the trend of some of the most exciting trade displays leaving before the public days got underway continued by such high profile aircraft such as the Boeing 787 and Airbus A400M departing during the week. Perhaps the star items for military enthusiasts were the pair of JF-17 Thunder jets from the Pakistan Air Force making their European airshow début at the event. Perhaps the biggest show of the year for most enthusiasts is the Royal International Air Tattoo at RAF Fairford. No other airshow in the UK attracts the amount or variety of military aircraft. 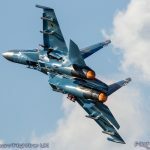 The show finally got the chance to host the European public display debut of the F-22A Raptor and also saw UK debuts of the Sukhoi Superjet 100, Airbus A400M and the EADS owned Messerschmitt Bf109G. The latter many felt was somewhat lost amongst the Battle of Britain flypasts which presented 14 warbirds flying together – s chance to see the aircraft solo would have been most welcome. 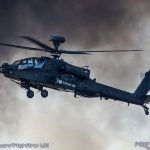 Overall, RIAT was a solid show if a little unspectacular compared to previous editions of the event and certainly would have been somewhat lacking if it hadn’t been for the likes of F-22 Raptor and A400M in the display. August is a much more relaxed month for many but the airshows are just as significant. There are several smaller airshows held during August with particularly successful events at East Kirkby, Rougham, Sywell and Little Gransden. However, the month is dominated by some very big seaside events. Eastbourne’s Airbourne show was the first four day event of the year and had a successful four day with acts old and new. Particularly welcome was the return of the Friday evening event dubbed “Come Fly With Me.” This year the event was even more special as the afternoon rain clouds parted leaving a dramatic cloudscape to frame the flying display with displays from the Typhoon, Spitfire IXT, Mustang and the Swift Glider displaying with wingtip fireworks. A week later Bournemouth Air Festival too hosted an evening show though one held much later until it was almost dark which was called “Night Air.” This event was even more spectacular and again the Swift Aerobatic Display Team starred with fireworks not only on the wings of the Glider, but also on the wingtip of the Silence Twister! 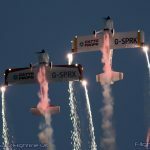 It was a spectacular finale to the evening, Sadly for the rest of the Air Festival and the Shoreham Airshow the same weekend low cloud settled on the South Coast prevented most of the flying displays at both events. Shoreham did manage a decent flying display on the Saturday but a combination of bad weather and an unfortunate landing accident involving the Swift Team’s glider on the Sunday did curtail events considerably despite the best efforts of the display organisers and pilots. Mike Newman, who suffered back injuries in that landing accident at Shoreham is now well on the road to a full recovery and has left hospital. The team too managed to complete later display commitments too, first with a pretty Pilatus B4 Glider and then the Dutch0 Glider Aerobatic Team’s Fox Glider. The bad weather continued to cause problems for the Clacton Airshow and also threatened to spoil events at Little Gransden and Dunsfold at the end of August. Thankfully, it cleared during that weekend and Dunsfold in particular enjoyed relatively good weather for what was one of the highlights of the season. 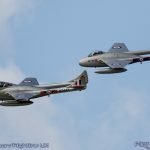 The Dunsfold Wings and Wheels show has grown into one of the finest airshows in the country and for 2010 was expanded into a two event for the first time. Dunsfold’s flying display not only attracts an eclectic mix of display acts, but also celebrates Dunsfold’s and Surrey’s aviation heritage with special displays and flypasts on top of some excellent motoring demonstrations on the main runway. It is definitely an event to watch out for in 2011! September not only featured Duxford’s Battle of Britain Airshow, but also excellent events over on Jersey and Guernsey, Leuchars, Old Warden and Kemble. Jersey not only featured the return of the SAAB J29B Tunnan and SAAB 105, but also hosted the UK debuts of the Belgian Hardship Red formation team as well as the first and last flying display appearance by one of QinetiQ’s Andover C1s. It also featured the last ever airshow appearance of the now cancelled Nimrod MRA4 aircraft which performed flypasts there as well as Guernsey. On top of other headline display acts like the Patrouille de France and Red Arrows, Jersey also hosted a world airshow first – a demonstration by “Jet-man” Yves Rossi and jet powered wing! It may have been hard to spot, but you could not fail to be impressed by just what Yves was capable of with the wing on his back and he received a hero’s welcome as he landed on the beach. The UK season was closed, as is tradition, by displays at Old Warden and Duxford. While Old Warden suffered some early autumnal weather, Duxford basked in a warm Indian Summer ending the season in style. September and October also saw Flightline UK visit some European shows at Sanicole in Belgium and the Festa al Cel, Barcelona. As well as the tradition one-day international airshow, Sanicole hosted it’s first Sunset Airshow which was quite simply pure airshow magic. The display featured many firework carrying and flare firing acts like the Breitling Jet Team, Swift Aerobatic Display Team, Royal Netherlands Air Force AH-64D Apache, Twister Duo and Belgian F-16AM Fighting Falcon. The main Sanicole International Airshow too was very special with great support from Belgian Air Force and other exciting acts such as the Red Bull TAH-1F Cobra and the Turkish Stars. I had always expected to be impressed by Sanicole, and it did not fail to deliver. By contrast, Barcelona was a really nice surprise. The show attracted some of the very best European displays as well as some very special surprises to what was a spectacular venue for an airshow just outside one of the world’s most exciting cities. 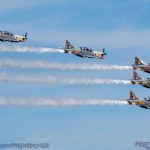 Some of the local acts such as the Firebombers and Hispano Super Saeta jets were intriguing while the presence of the Patrouille de France, Patrulla Aguila, Dutch and Belgian F-16s along with the EF-18 Hornet made for a very special airshow. 2010 was unquestionably a memorable airshow season thanks to some high profile anniversaries and some superb new displays. The emergence of more Sunset displays is very exciting too and something that other events must consider for the future, particular some UK acts pioneering special displays for such events. If I had to single out one particularly outstanding display, it would have to the RAF Battle of Britain Memorial Flight Spitfire and RAF Typhoon duo that graced many of the larger airshows of the year – it was quite simply inspired, not only as a spectacular piece of flying but more than any other display it captured the imagination of airshow audiences in this very special year. There has been some excellent variety despite economic difficulties but you cannot help thinking that the economic situation has yet to really bite UK airshows. We have already lost Biggin Hill from the 2011 calendar, but with dwindling council budgets, ever increasing costs and military cutbacks something else may have to give. The recent Defence Review may have spared the Red Arrows, Battle of Britain Memorial Flight and Falcons Parachute Display Team but the situation concerning other RAF displays has yet to be confirmed. The current economic situation is also of concern to private operators; we’ve already seen Delta Jets take on a completely different structure and difficulties for other operators. There are certainly interesting times ahead.